Phoenix-based CoalSack Energy, Inc. is a fledgling company launched four months ago with the express goal of taking their groundbreaking technology to market. It’s based on the technology developed by Harold L. Bennett, a 78-year-old civil engineer from Albuquerque. It seems that CoalSack is in the pretreatment of coal business, until now a non-existing business, but should all the work of Mr. Bennett work at commercial scale, coal would be a much less environmentally aggravating fossil fuel. Not that would make any difference to the anti fossil fuel crowd, but it would be significant to everyone with some reason and balance in mind for the consumers, the environment and the economy as a whole. The technology is claimed to make it possible to convert any type or grade of coal, including scrap coal, oil shale, tar sands, etc., into three basic by-products char, synthetic oil and gas – through one integrated process. This should be getting attention now. That’s big money. And scrubbers need maintained. Clean-Tech Energy Concepts has patents and a functioning prototype in operation. Most importantly, the infrastructure needed to refine, distribute, and use the technology on a mass global scale is currently in place. This includes production, supply-chain distribution, utilization infrastructure, markets, financial infrastructures, and the boiler and engine technology needed to burn the char and liquid fuels created from the synthetic oil after it is refined. “Clear Coal™” technology is the only integrated process in existence that was developed specifically to create oil from coal, and still deliver a smokeless boiler fuel, liquid petroleum gas, and producer gas without cross contaminating the end products. The ‘Bennett Process™’, takes any type or grade of coal, including scrap coal, oil shale, tar sands, etc, and creates three basic products: char, synthetic oil, and the gasses. For every ton of coal, our process yields roughly 3/4 ton of char, 3/4 barrel of synthetic oil, 1/2 barrel mixed piqued petroleum gas, and 3,000 standard cubic feet of fuel gas in the form of methane and hydrogen. Clear Coal Process Graph. Click image for the largest view. Using a low temperature carbonization process, we are able to carefully control internal temperature ranges inside a roasting unit called a Coal Carbonization Module or CCM™ to vaporize the contaminate elements contained within coal. These vaporized elements are then transported to tanks using steam, whereupon they are condensed into their natural, uncontaminated forms. We are able to produce the nearly contaminate-free char, synthetic oil, and synthetic gasses that are sold to industrial markets, such as refined into Coke for steel production, used for electricity production, or refined into liquid fuels like gasoline, diesel, and Jet A. 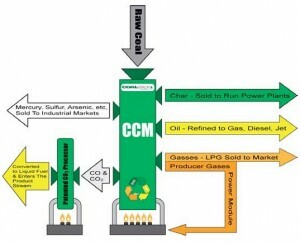 The carbon monoxide and carbon dioxide production is also converted into liquid fuel, and injected into the product stream where it is sold as a value-added product. Those four products are interesting. The char is a clean burning smokeless boiler fuel, which can be used for electricity and heat production. The char may also be used in the production of steel and activated charcoal products including filters and carbon fiber. Char has a higher BTU range than coal, 12MBTU/lb – 14MBTU/lb, making it more valuable per ton. Utilities using char as a fuel source become carbon creditors, and could eliminate expensive flue gas scrubbing units. The synthetic oil is contaminate-free, low temperature oil extracted from the coal that can be converted into jet fuel, gasoline, diesel, and other high value fuels. At a BTU value of 17,370BTU/lb it can also be used as a sweetener of conventional crude supplies. CoalSack’s synthetic oil has been tested by International Lubrication & Fuel Consultants Inc. and other independent labs, and is verified to contain a “much higher amount of gasoline range materials” than conventional crude oil, making it easier and less expensive to convert into fuel. The synthetic oil is easily refined into gasoline, diesel, and Jet-A. The synthetic gasses are contaminate-free producer gases of petrochemical feedstock including H2, propane, butane, ethane and methane. Each CCM unit creates enough producer gas byproducts to fuel itself, eliminating the need for external fuel sources during operation. In addition, the gasses may also be sold to spot market. Carbon monoxide and carbon dioxide instead of being captured, contained, and stored underground, are channeled, condensed, converted into liquid fuel, and inserted into our product stream. This portion the patented technology may also be licensed to the ethanol industry to convert their CO2 into liquid fuel, so creating a separate business. The outstanding feature is the mercury, sulfur, arsenic and the trace elements can be sold for use instead of launched into the air or buried in hazardous waste sites. This alone is cause for great hope. I wish these guys well. It should easily be worth many interest’s time and expense to investigate the claims and examine the demonstration unit. A quick overview of their PDF gives one a sense that they’re deep into investor marketing and could use a little coaching as the customers are either coal producers or huge coal burning utilities with an entrenched conservative and leading edge technology adverse nature. But a little time, a few interviews and some investor support would go far. On the other hand, they could just buy coal and sell their products. The value added looks to be very substantial with minimal running costs. Good luck guys. A coal plant without scrubbers in the stacks would be a giant leap forward. It appears that removing pollutants on the front end whilie they are still solid is more efficient than removing them on the back end when they have been converted into gas. Why don’t they have a proper website?? I am very interested in following up more on this, since we have large coal resources in South Africa just lying around in some places. It is not clear how they can separate Sulfur, Mercury and Arsenic from other products. Is it fractional distillation of vapour? THIS PROCESS WAS FIRST SUGGESTED BY A GENTLEMAN WORKING FOR THE DEPARTMENT OF MINES(SINCE DEFUNCT) IN 1936!!! HE WAS NOT ALLOWED TO PUBLISH HIS FINDINGS BECAUSE HE ADVOCATED GIVING AWAY THE PETRO CHEMICALS IE GASOLINE. I still am not sure about how the poisons are separated. Sulfur and Phosphorous could be in gas and easily removed. I believe this is the most beautiful holiday gift for your loved ones.